The keep fabrication hull design was conceived as a four plane partial deep V. The design would allow for various actual implementations (current plans are for acrylic extrusion with added internal structural elements). 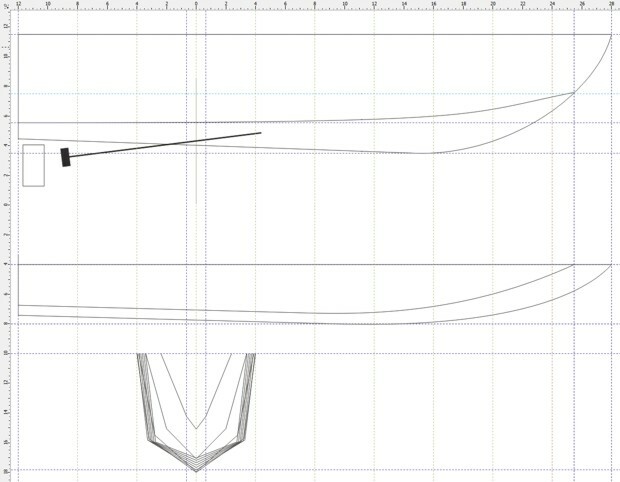 Check FREE!Ship if you are looking for a great hull design and calculation tool! I always figured doing something like this with an off-the-shelf model boat hull. I remember that the winners of the DARPA Challenge saw it as a software problem, not a hardware problem; so while the others were fabricating custom dune buggies and creating new problems for themselves, Stanford simply went with an off-the-shelf VW Touareg fit with factory hand controls and I/O. That was our initial plan too. Looked around for a while but couldn't find anything with the right dimensions and displacement (need 15-18kg total displacement and sufficient free board to keep deck above waves/splashes). Plus everything that was available in our size range needed significant reinforcement if it is to survive the passage. Finally gave up and decided to build something from (almost) scratch. The Touareg would probably sink anyway.